I'm so glad that Starbucks is literally located everywhere in the world. For example, last Monday I was really missing Seattle, my so called second home, and thankfully there is a Starbucks right at Brussels Central Station to fill my craving. The staff were friendly and energetic at 8 o'clock in the morning as I walked in. 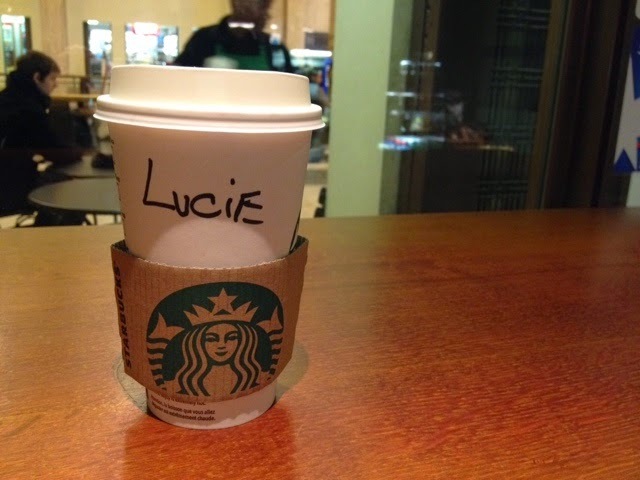 They happily took my name spelled as "Lucie" (How cute!) and my order just like remembered in Seattle. Comparing to the States or Taiwan, there are not that many cafes around Belgium. On the contrary, the word "Cafè" is referring to a bar where it serves alcoholic drinks instead of espresso and fresh brewed coffee. What an interesting fact! As I was browsing the Internet this afternoon, there are some espresso bars, tea rooms, and brunch places poped up. It'll be fun to visit them in a sunny afternoon to relax and indulge.